I spent most of last week working on more blocks for my chedddar and brown Easy Street quilt. The quilt originally supposed to be in a 4 x 4 setting but I opted to make more blocks so it’s in a 5 x 5 setting and skipped the borders. That makes it 105″ x 105″. That’s officially the biggest quilt I have ever made. Now to figure out how I am going to quilt it!! It’s really bigger than my machine can handle…. I haven’t pressed it yet. All in all, I am very happy with it. I like the color choices too. When straying from the original colors, it’s always a little unnerving until I see the final product. I have Easy Street #2 well under way too. In this one I replaced pink for purple but other than that, it’s all the same. All the “B” blocks are done along with the corner and setting triangles. I almost have all the “A” blocks done too. This one is not going to be made larger. It’s just going to have a border like the original pattern calls for. To see what others are working on, check out Patchwork Times. To see some Easy Street progress check out Quiltville. 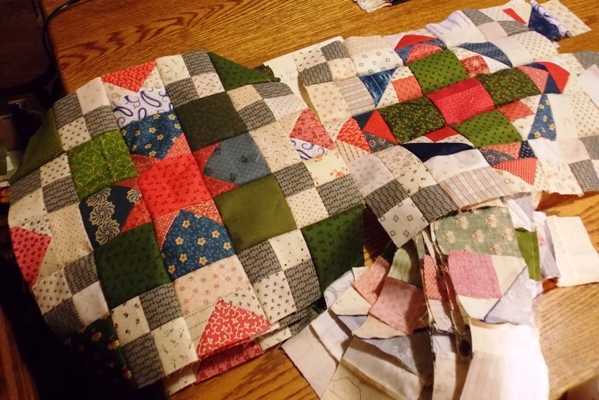 This entry was posted in Quilting, What I'm Working On on January 7, 2013 by Jo. That is one huge quilt! I love the two colorways you chose – you have a totally different quilt than everone else – I have seen so many aqua/green!!! Good luck quilting! Good job! What a finish! Nice colors in both of your Easy Streets. Bonnie makes a lot of large quilts for sure! I always know this going into any of her mysteries. I like that you changed up your colors to truly make it your own. Congrats on not only making one but goodness starting another! I can’t imagine how much time you must spend piecing. Beautiful quilt! Love the colors! My Gammill table is 12ft and I have quilted quilts that are 108×108. If yours is 12ft. You should be able to quilt your beautiful quilt! Enjoy your day! Thanks so much for showing us your blocks! i knew from seeing previous pics of the parts that you quilts would be beautiful, and they are. I just love the cheddar! It makes we want to do another one!! Beautiful quilt! I can’t wait to get mine done now! Both versions look great! You are one speedy sewer! Love your quilt – I did not sew it yet, but it’s on my bucket list. (Have saved all the instructions.) I agree, changing the colors is sometime unnerving, not knowing how it will turn out. I think any of her quilts would turn out great with any colors. From northern Iowa . 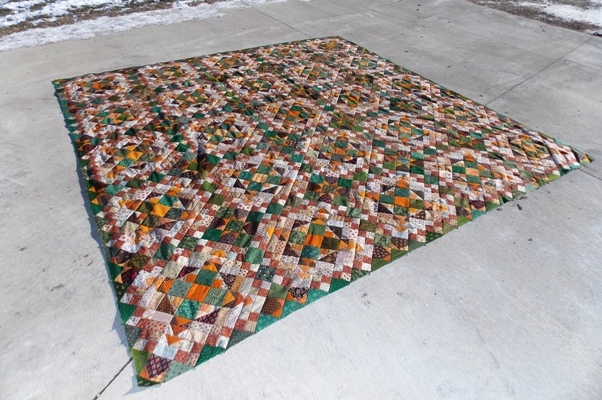 . .
Love your cheddar/brown/green color combo for Easy Street! That’s one big beautiful quilt! That is a huge quilt but I love everything about it. Great color choices!!! Next time Bonnie does a mystery, I’m in. I regret not doing Easy Street. Every one I see is beautiful!!! Beautiful quilts, Jo! Love your color choices. Really unique! That big one will cover you for sure this winter. Love it! Take care! Love it. That is one big quilt, but gorgeous. Wow, one done and another well on it’s way. And I am pleased to have 5 blocks and 3 triangles done. Love both of your color combo’s and I agree that it is a little unnerving to have to wait to see if your color choices are going to work. Good luck with the quilting. WOW!! You deserve the Kudos for that finish! I’m still plugging away on my first ES, and it’s the original size. You are making 2 and one of them is way bigger! Congrats on a great finsih! Lovely and I think you have such great color choices. Nice, the only way I can quilt anything these days is with the long arm because I can’t wrestle all that bulk!! Congratulations on getting 2 Easy Street quilts pieced – your deserve a prize. Looking forward to seeing them on your new longarm. fabric closer to your colors, since I have more of those in my stash. Nice job. With the second one, you might want to try quilting it in sections and then attaching them to each other. You would divide it into three sections on the diagonal. I’d suggest it for the first one but I hate taking out seams. Both are truly gorgeous, Jo – love the color schemes and how they came out. I love both your colors schemes, but orange and green is absolutely my prefered! Great colors for both quilts! I can never bring myself to do the mystery…until I have seen the entire quilt! I would hate to spend all that time, effort, and fabric on something that I didn’t like! Your choices have given me some inspiration, though…. Impressive! It looks really great! OMG I am so far behind! I don’t even have all of the blocks made let alone sewn together. You are awesome! I love it! I really like your color choices. LOVE LOVE LOVE the cheddar and brown easy street. Big and beautiful!! That is one massive and gorgeous quilt! Way to go on the second one too. 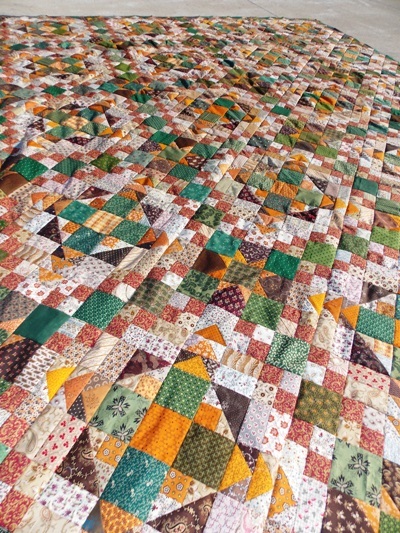 I think I need to do a cheddar quilt – yours looks fantastic. Well done! Amazing how quilts can grow, isn’t it? At least with as busy as this pattern is, you don’t have to do custom quilting on it…the beautiful fabrics you used will shine on their own!!! You are such a fast and prolific piecer! Both your Easy Streets look fabulous and I love those Civil War reproductions. Good job! I first thought the top picture was the quilt finished already (quilted). I have been surprised to find so many people making 2 of these babies at the same time. Amazing – both of them. Love your easy street #1…that pop of yellow is gorgeous…and you are doing a second one, wow.